It appears electric vehicles of all shapes and sizes will soon be the norm. Daimler, the parent company of Mercedes-Benz, has developed an all-electric school bus, which is scheduled to be distributed in the United States in 2019. The Saf-T-Liner C2 Electric Bus from Daimler subsidiary Thomas Built Buses will feature a range of 100 miles, capable of seating 81 children and powered by a 60kWh battery. 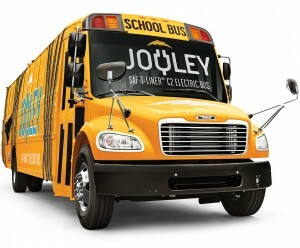 If operators want a higher range for the “Jouley” bus, there will be additional battery pack options available courtesy of Daimler’s electric technology. At the moment, it is estimated Daimler’s Thomas Built Buses hold a whopping 38.7 percent market share in the US, meaning the Jouley is quite literally the future of school buses.